“Quotidian” is the way gun violence expert Garen Wintemute and psychiatrist Amy Barnhorst describe the day-to-day drumbeat of gun deaths to which Americans have become inured — the suicides, incidences of domestic violence and crimes that go unnoticed because they are so much a part of our lives that they aren’t considered newsworthy. 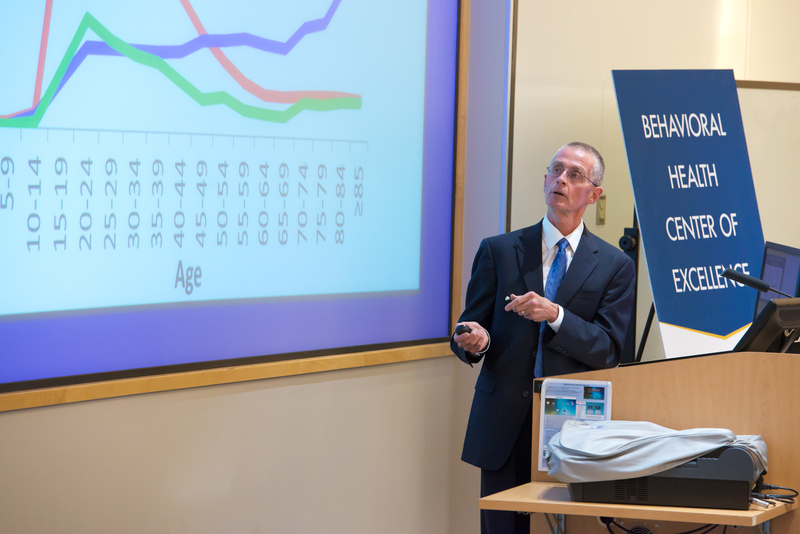 Barnhorst and Wintemute, professor and director of the Violence Prevention Research Program, spoke Tuesday, May 3, during a seminar on “Firearm Violence and Mental Illness” sponsored by the Behavioral Health Center of Excellence at UC Davis, held in the Education Building on the Sacramento campus. People with mental illnesses are far more likely to be victims than perpetrators of firearm violence, they said. Yet with each mass shooting a link is made with mental health that only further stigmatizes the mentally ill.
“Much prohibitory legislation is focused at people with mental illnesses, though the potential impact that this legislation is likely to have on overall community violence is quite small,” said Barnhorst, assistant professor of Psychiatry and Behavioral Sciences. Other populations would be more effective targets of legislation for decreasing the rate of gun violence. "It may be more effective to focus future interventions on groups at a known increased risk: substance abusers, particularly alcohol abusers, and people with a prior history of violence,” Barnhorst said. Unfortunately, firearm violence must become egregious before it registers in our consciousness and while the mass shootings seem ubiquitous, these represent only a tiny fraction of the shootings in the United States. In fact, homicide has decreased somewhat and suicide deaths are on the rise. Overall, the rate of gun violence in the United States has remained the same.